This style of trap is the best rectangular portable trap style that we've found. 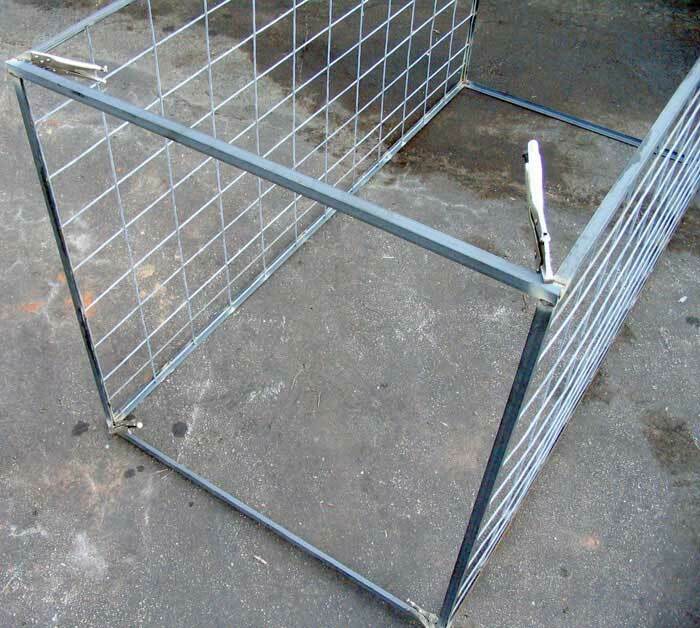 This shape is easily the most common of hog trap designs, as the materials are readily available, it will fit in a truck bed, and is easy to make. And at first glance, the animal trap's best feature may not be fully appreciated. It is the swing-style door that we refer to. Rather than a rooting door which the hog picks up, this door swings shut behind the pig. 5 Heavy-duty agricultural panels (aka cattle panel, bull fencing) @ 8 or 10 feet. Note: See our welding caution. 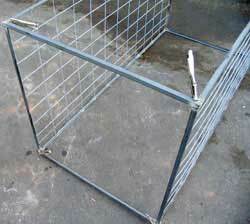 A standard portable hog trap (if there is such a thing) is 4'x8' feet. However, this measurement is more a function of the size of cattle panel that is available. If you use 10' panel, you can make it 10 feet long for no more cost. You'll likely appreciate making the trap to fit inside your truck bed. Make note that truck beds are not perfectly square — measure both in the front and back if this is your choice. A 4'x8' trap will fit a standard Chevy full size bed. To visualize consider that a sheet of plywood is 4'x8'. The height is largely up to your personal choice. You don't need a particularly tall trap since hogs are short. However, the size cattle panels is 52" tall, and cutting them in two would result in a trap measuring only 26" high — quite small — and so making the trap short for reasons of thrift won't be effective. But making it shorter than the full 52" will result in a light trap, and therefore you may decide that cutting the panels to a shorter height is worth the work. If you decide to use the full size of panel, you may use this list. Using vise grip pliers will help during construction. Start the project in a flat, level area, such as your concrete garage floor, and ventilate well. First, build a 4'x8' rectangle. Lay out the pieces on the floor and ensure your edges are squared. Tack at the corners, do not finish weld. Check that your project is still square and not warped from heat or bumped out of square. When satisfied, finish weld. Repeat this process for the second 4'x8' side. Now, raise the two sides and place the front and back frame members between them. Secure the members with vise grips or C-clamps (Fig. 1). Check again for being in square, and weld the frame secure. Cut and install the paneling for the rest of the trap (Fig. 2). If you're using galvanized panel, like we did, be very careful about the fumes, they will make you sick, and if you're not aware of this, you need to be welding with someone more experienced. 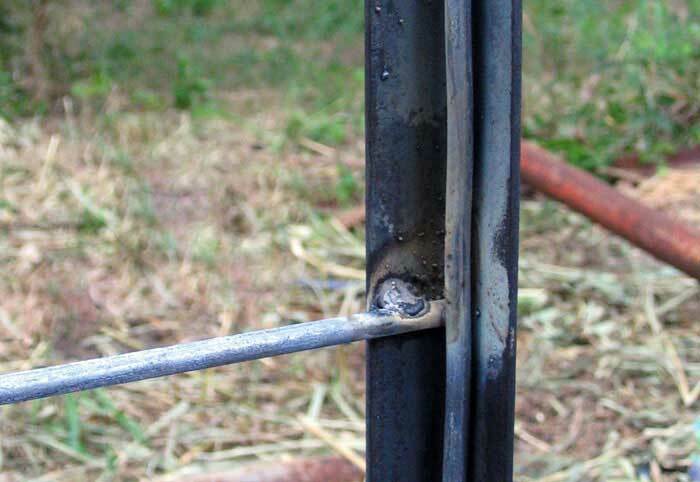 You'll need to pay close attention to your welds. 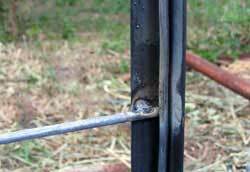 You need adequate penetration to secure it to the frame, but the small wire is easy to burn up. 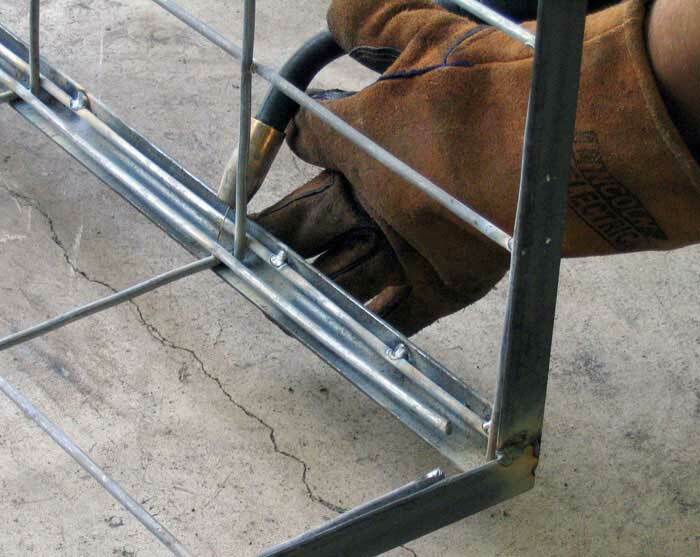 To achieve good welds, you'll need to spend more time on the framing member, heating it, and then dipping the puddle into the wire ever so quickly. This will take some time to get right, and it's critical to making a trap that is safe and secure. The cattle panels should be tack welded to the frame wherever possible. Pigs are very strong, especially when angry, and have a tendency to break out of traps. If you've made a strong and heavy trap, a bottom is not necessary for your trap, and if it's tall enough, perhaps a top isn't either. Including them raises the weight and cost. However, most people include one, we do, and we recommend you do. The advantage of a fully enclosed trap is your safety. And if you ever choose to move a live pig, you'll have the ability.